Question 5. A person needs a lens of power –5.5 dioptres for correcting his distant vision. For correcting his near vision he needs a lens of power +1.5 dioptre. What is the focal length of the lens required for correcting (i) distant vision, and (ii) near vision? (ii) In case of near vision. Answer. A concave lens is required to correct a myopic vision . Question 7. Make a diagram to show how hypermetropia is corrected. The near point of a hypermetropic eye is 1 m. What is the power of the lens required to correct this defect? Assume that the near point of the normal eye is 25 cm. 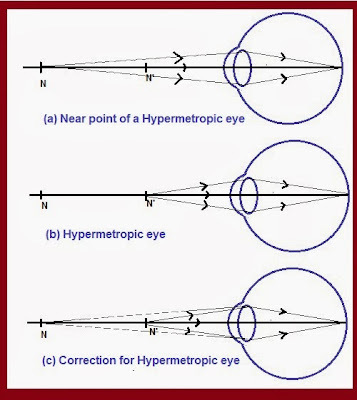 As we know that hypermetropia is corrected by using a convex lens. 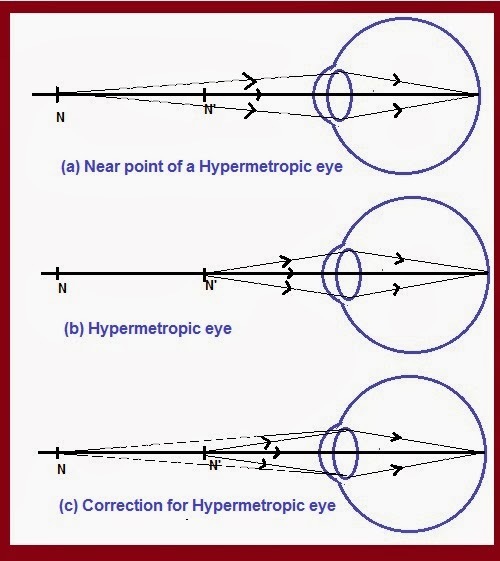 Here, The near point of a hypermetropic eye is 1 m and the near point of the normal eye is 25 cm. Question 8. Why is a normal eye not able to see clearly the objects placed closer than 25 cm? Answer. The eye lens is composed of a fibrous, jelly-like material. To see closure and distant object, Its focal length can me changed to certain extent by contraction and relaxation of ciliary muscles. The ability of the eye lens to adjust its focal length by contracting and relaxing its ciliary muscles is called accommodation. To see closer object, ciliary muscles, must decrease the focal length of eye lens. However, the focal length of the eye lens cannot be decreased below a certain minimum limit. To see an object comfortably and distinctly, the distance of object should be at least 25 cm from the eyes. Due to this, a normal eye is not able to see clearly the objects placed closer than 25 cm. This distance at which objects can be seen is clearly, is called the least distance of distinct vision or the near point of the eye. Question 9. What happens to the image distance in the eye when we increase the distance of an object from the eye? Answer. There is no change to the image distance in the eye when we increase the distance of an object from the eye. To see closer or distant object clearly, the eyes, due to its ability of accommodation, can increase or decrease focal length of its lens, so that the image is always formed at retina. The eye lens is composed of a fibrous, jelly-like material. To see closer or distant objects, focal length of its lenses can be increased or decreased to some extent by the contraction and relaxation of the ciliary muscles. Answer. The earth atmosphere consists of layers of different gases of varying density. Since the physical conditions of the earth’s atmosphere are not stationary. The refractive index of atmosphere goes on changing continuously. As the starlight, enters the earth’s atmosphere, it undergoes refraction multiple times before it reaches the eyes on earth. This makes the apparent position of the star changing slightly and continuously. Since the stars are very distant, they approximate point-sized sources of light. As the path of rays of light coming from the star goes on varying slightly, the apparent position of the star fluctuates and the amount of starlight entering the eye flickers – the star sometimes appears brighter, and at some other time, fainter, Hence the twinkling of stars. Question 11. Explain why the planets do not twinkle. Question 13. Why does the sky appear dark instead of blue to an astronaut? Answer. As an astronaut moves far away from the earth atmosphere and fly at very high altitude in the space, the medium becomes rarer. Due to the absence of air molecules or fine particles, there is hardly any scattering of light. That is why, the sky appears dark to an astronaut flying at very high altitudes, as scattering of light is not prominent at such heights.